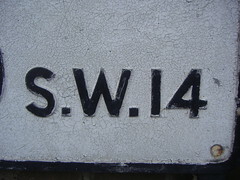 Compact South-West London postal district covering Mortlake and East Sheen, in the London Borough of Richmond-upon-Thames. It has a crossing over the River Thames at Chiswick Bridge. Last edited 2008-04-11 13:05:38 (version 5; diff). List all versions. Page last edited 2008-04-11 13:05:38 (version 5).